Now that we’d bought land and decided to build a house, we had to actually sit down and think about what that house would look like, how we wanted it to function, and what are needs are now and in the future. We do not intend to build another house ever again. We intend for this to be the house that we’ll live in until we are old and grey and they are going to have to drag us away from kicking and screaming (I fully intend to be like my Grandparents who are 90 and 88 years old were still living on their farm). This is a lofty task though! We’re both 31 years old – thinking about what our needs will be when we’re 90+ is a bit intimidating. That being said, the process of designing and dreaming up our future home has been super fun, despite the challenges. Both of us have always been drawn to interior design and architecture. My mom is an interior designer and Darcie had nearly moved to Toronto for interior design school. We’d already spent countless hours reading design magazines and blogs, posting on Pinterest, and redesigning our previous house. Now we actually started to have to analyze all of those things that we liked, didn’t like, were intrigued by, et cetera, and try to figure out what it was about those things that we were drawn too and just as important, what it was we didn’t like. Living in a 102-year old character house for the past four years, there were elements that we wanted to take with us and recreate and there were those that I can happily do without. In our old house, I loved the simplicity of it’s basic shape – a square with an evenly peaked roof and a balance of windows on either side – also, it’s 9-foot ceilings, the cast iron sinks and tub, and for an old house it had a very nicely sized living room, dining room and bedrooms. I also really liked having a living room and a separate media room (I’ve actually grown to loath a TV in a main living room). 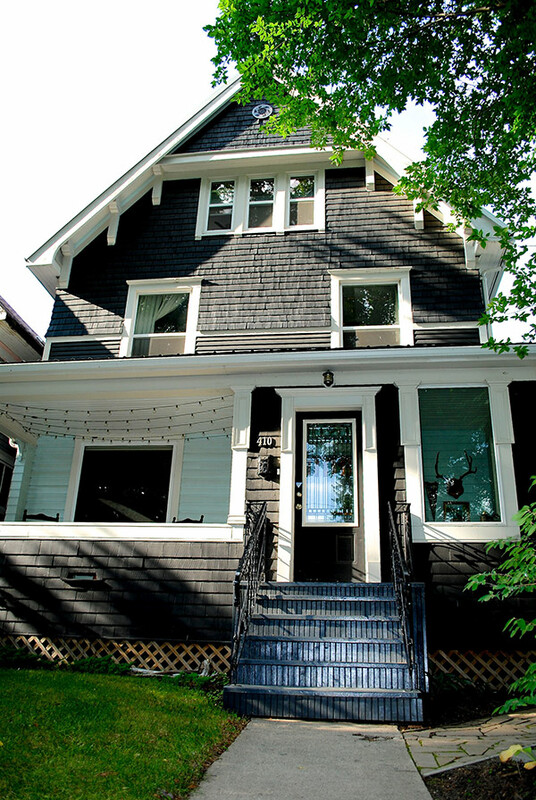 Also, our old house was painted black and our new house would most definitely include some amount black. However, there were also a lot of things that we didn’t like about our house and I’m glad that we’ve experienced these so that we avoid and rectify these issues in the next place: Small kitchen (we are moving to the country in large part due to food. The kitchen is going to be a centrepiece), dark interiors (poor lighting, incorrect placement of windows, and dark walls and woodwork), bathrooms (why did we have 4 bathrooms?! The toilets and other fixtures were low quality), stairs (five flights of stairs, enough said), maintenance (old houses are constantly in need of repairs, I need a relatively easy to maintain house), drafty (Passive House! ), and too big. For a house designer we hired our good friend and architectural designer, Crystal Bueckert at BLDG Studio Inc. There was really no decision here, she was our one and only choice. Her houses are the coolest ones in town by a long shot. Plus she already knew a lot about energy efficient design and was trained in Passive House. As a starter, we sat down with her and measured out all of the furniture in house that we were going to take with us. This way the house is designed in part based on our current interior design. She also suggested that we put together a portfolio of all of the photos we liked and label what we liked about them. Well, frick, I had 500 photos pinned on Pinterest already and I like all of them! Over the next couple weeks we started going through them and began to really consider if we thought they were just cool/interesting or if we would actually want to live in them (this is a VERY important distinction to make). We gradually narrowed it down to about 60 photos. After we scrolled through them looking at each of the photos, we realized that, hey, we got a pretty awesome looking house here! There were trends that kept coming up in the houses we were drawn to: a simple vernacular house, white/black and wood exteriors, large wood-framed windows, light minimal woodwork, white walls, white subway tile, vaulted ceilings, concrete floors, and wood burning stoves. Although we wanted a modern home, we do not want it to be ‘ultra’ modern or bring visions of science fiction or James Bond. We were particularly intrigued with Vernacular Architectural – designing houses that reflect local traditions and local needs. In SK, on the prairies, that is agriculture and farming. Essentially we’ve realized that we want a modern farmhouse.